When Oliver recently turned 5, I promised him an Outer Space room fit for any aspiring astronaut. As part of the transformation we got to try out some great products, and I also had an excuse to come up with some space themed crafts. 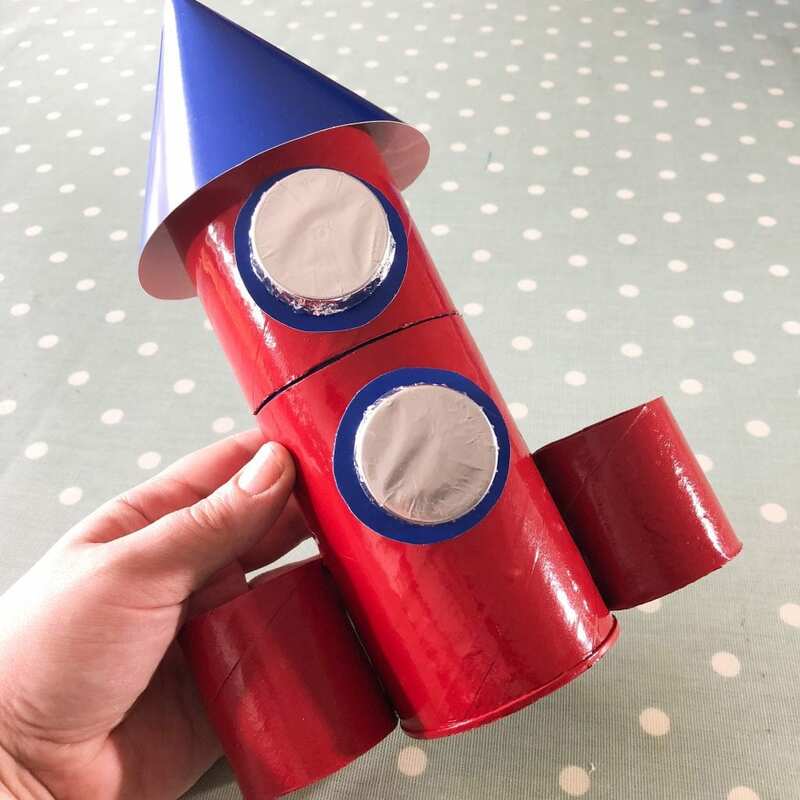 The first of which is this DIY Space Rocket Desk Tidy made from old cardboard tubes. 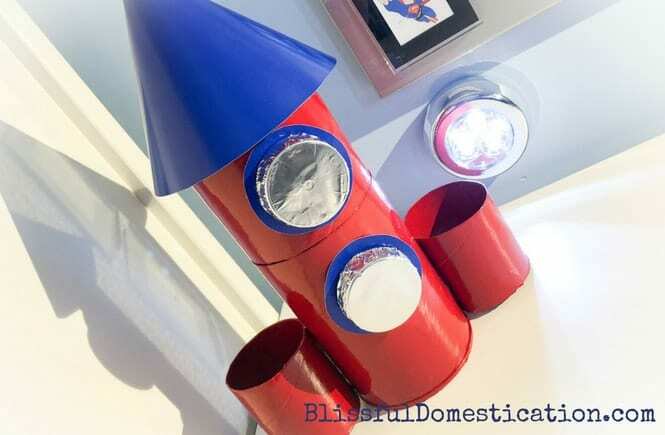 This Space Rocket Desk Tidy is really practical and made from just throw away items. 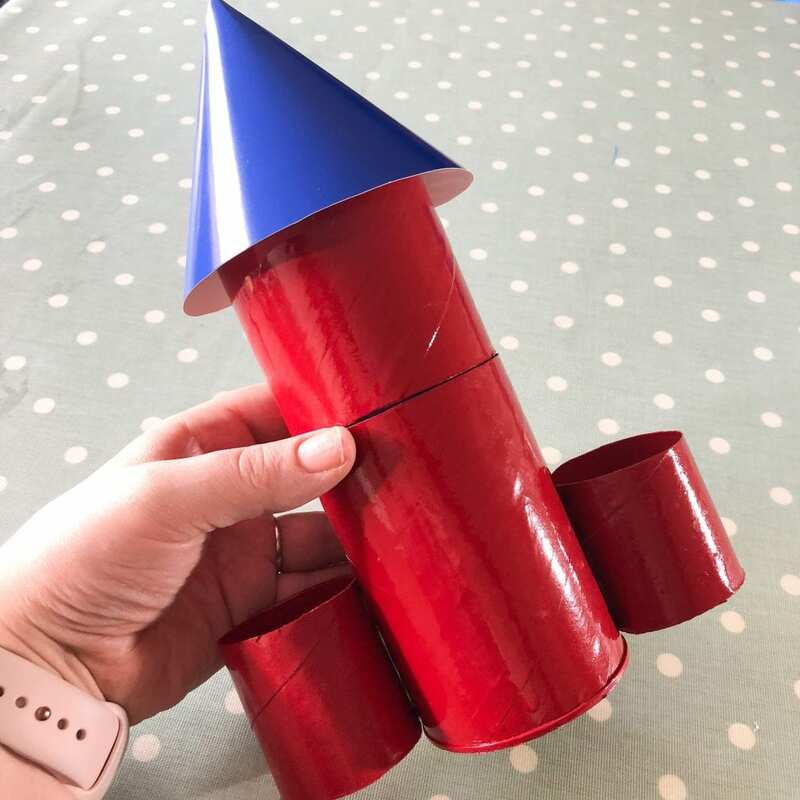 I actually decided to make it not just because I like to get out my craft bits and bobs, but also because I just simply couldn’t find a Rocket desk tidy anywhere! 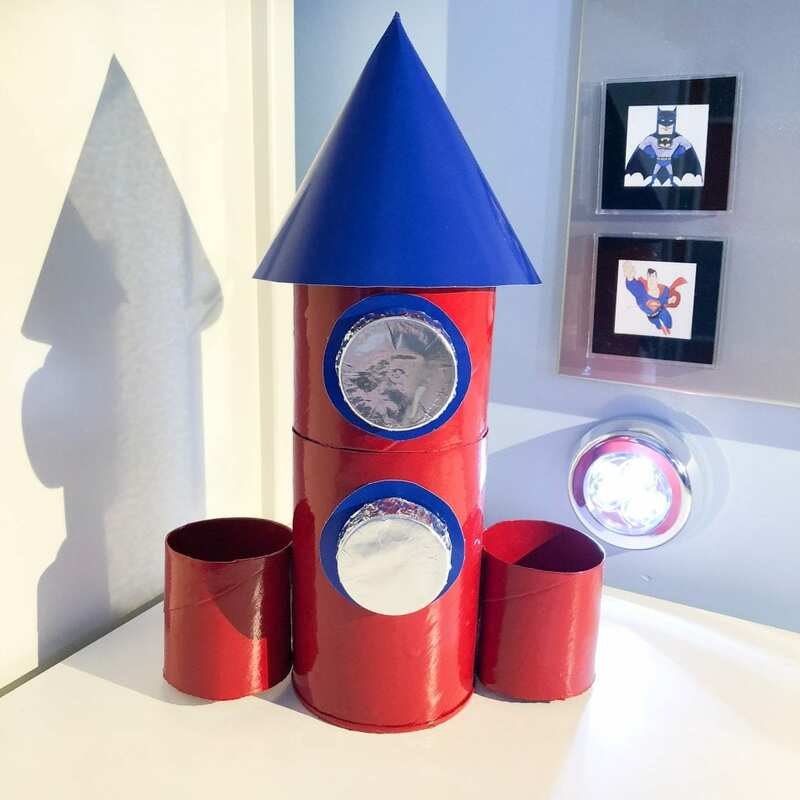 It’s extremely easy to put together and goes brilliantly with Oliver’s new Outer Space bedroom. The colours could be easily adapted to suit any room decor, and perfect for any space mad kiddo. Also great for keeping all the pens and pencils is one place, so makes the room look tidier too. 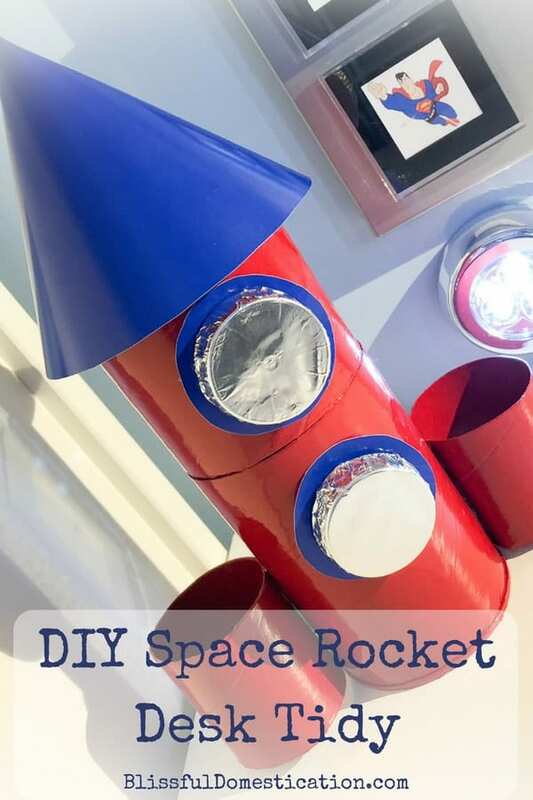 So if you would like to see how to build your own Space Rocket Desk Tidy, then read on, or Pin it for later! First cut the larger tube 11cm from the bottom, and 8cm from the top. I found the easiest way to ensure a straight cut was to measure in several places and make small marks. Then place the elastic band around the tube lining up the marks. This then gives you a guide, and you can use your craft knife to follow the line of the elastic band. 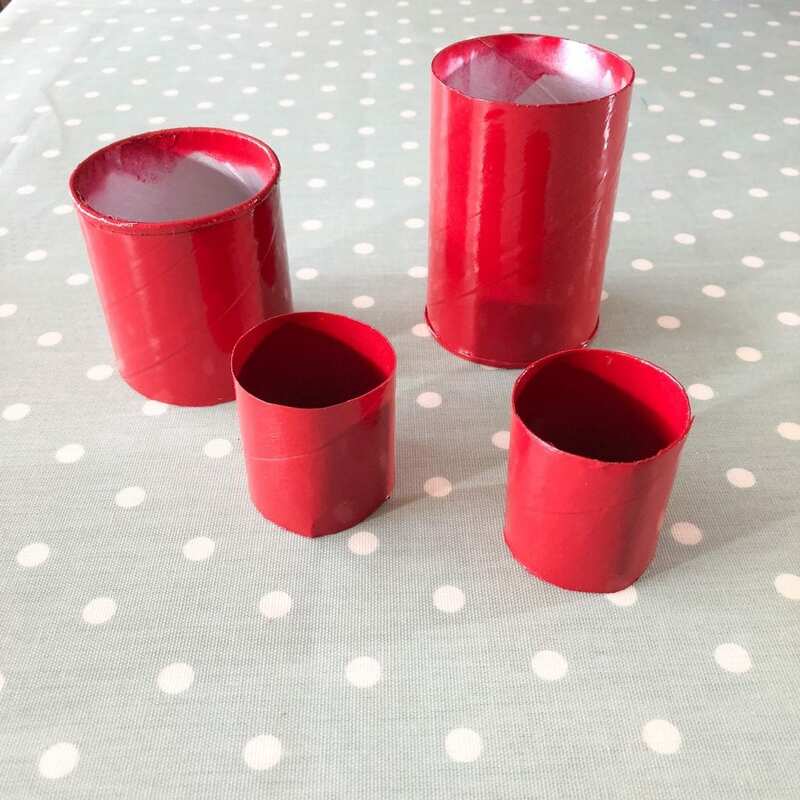 Cut the thinner tube/s into two 5 1/2 cm sections. 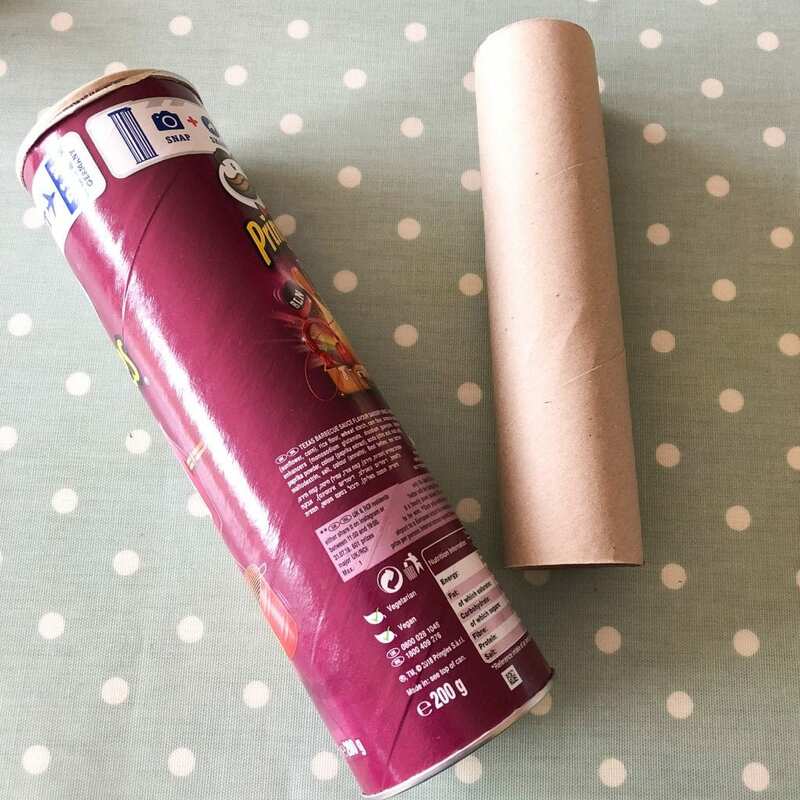 These type of tubes you get in kitchen towel and loo roll tend to be a lot thinner so it is possible to cut them using a pair of very shrap scissors. 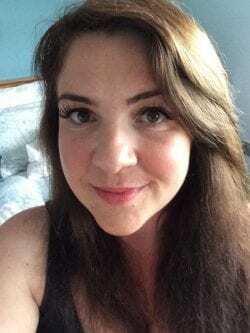 It is still useful to use the elastic band method to keep your cut straight if you wish. Now the tube sections are ready to be spray painted. Make sure you read all the instructions on your spray paint, and follow all the necessary precautions. As with all spray paints it is advisable to do it in a well ventilated area, preferably outside, and use several thin coats to avoid dripping. I needed to use 3 coats on my cardboard tubes. 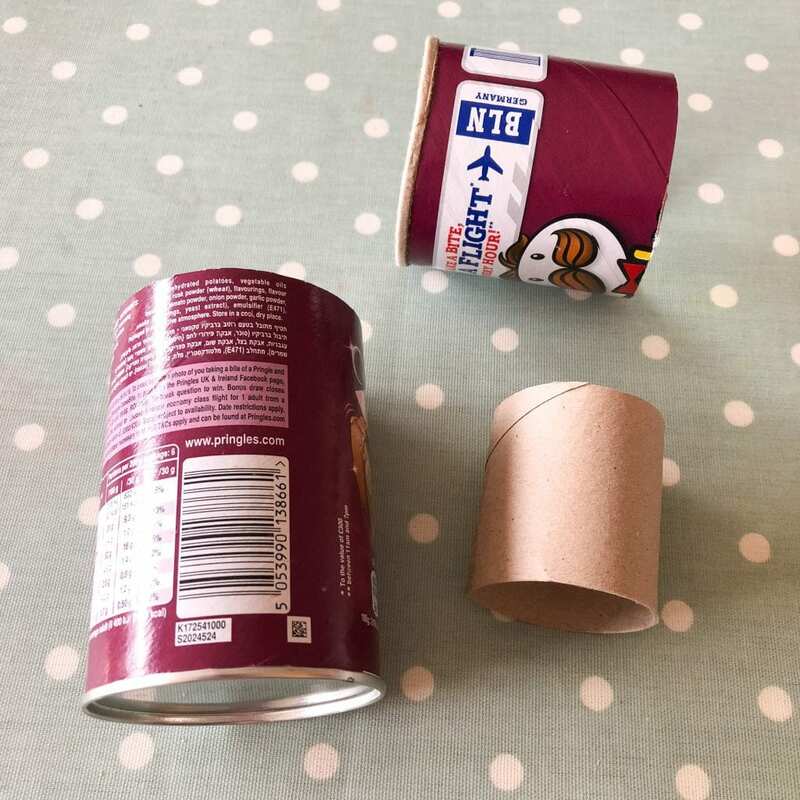 When completely dry you can start to assemble your rocket. 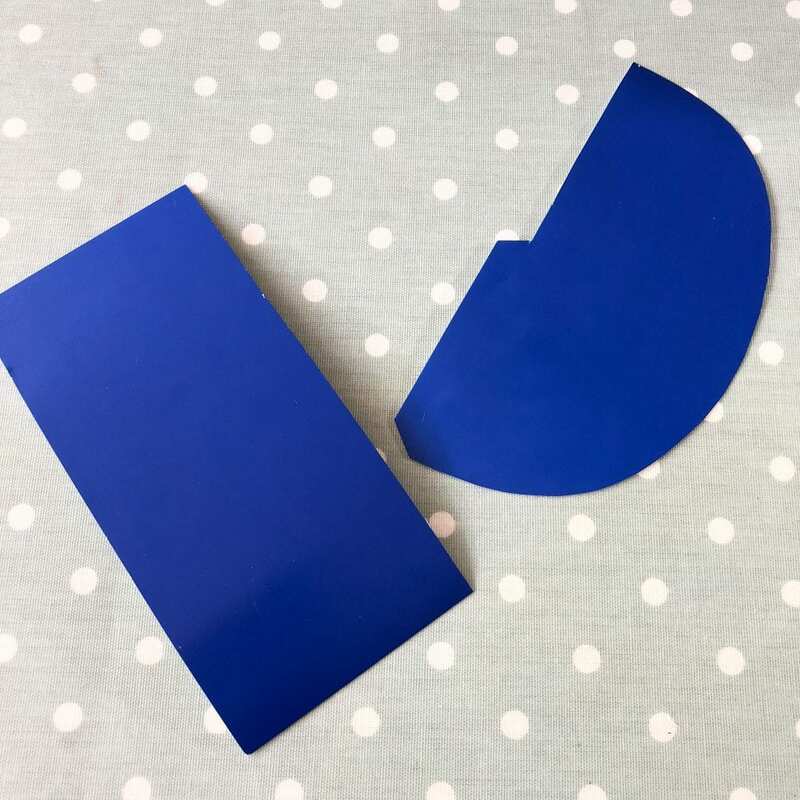 You need to cut a rectangle and a semi circle with a lip from your blue piece of card. To know what size semi-circle to cut, I first made a paper template cone, then transferred it to the piece of card. 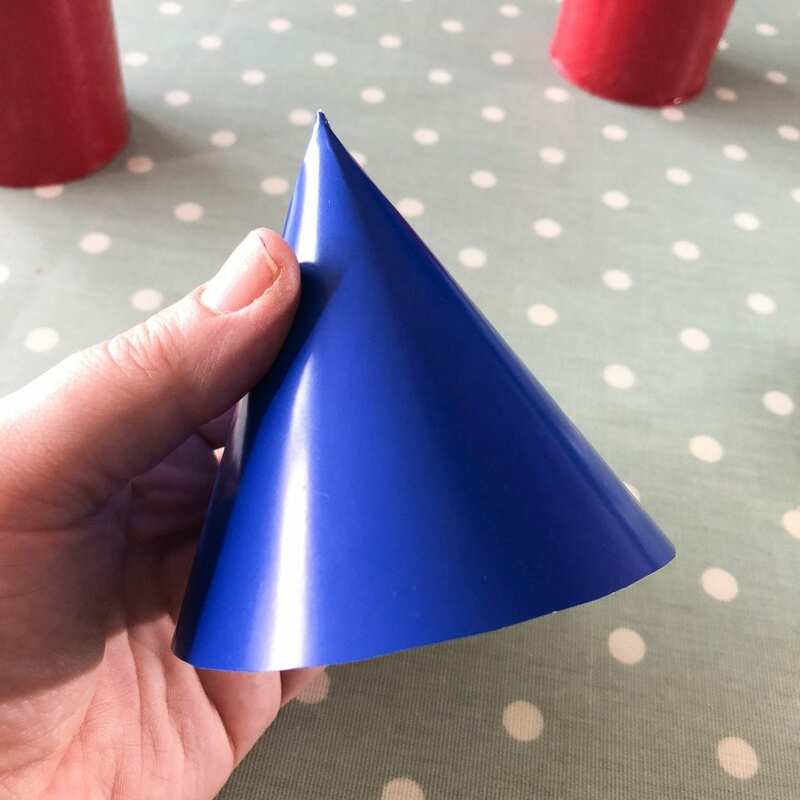 The lip on the semi circle can be scored and glued, and the semi circle folded round to make a cone. 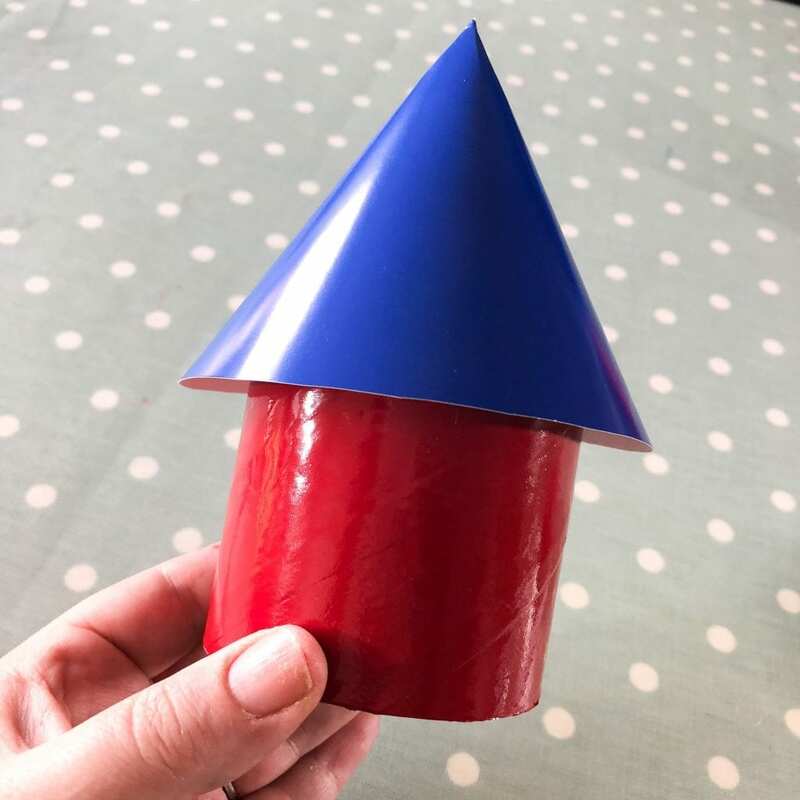 Glue the cone onto the cut edge of the 8cm larger diameter tube. 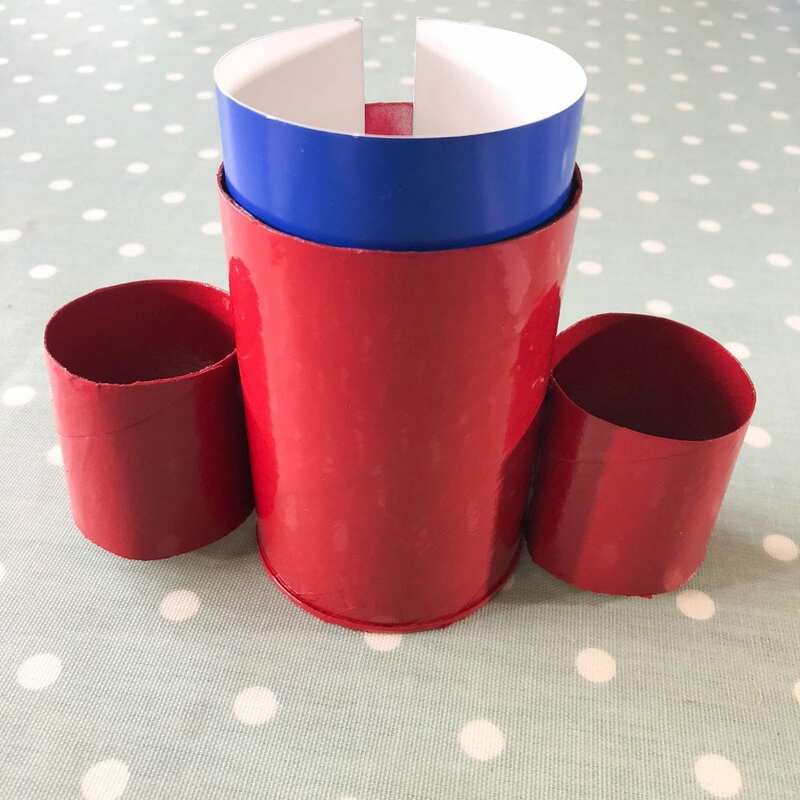 Then glue the rectangular piece of card to the inside of the larger piece of cardboard tube, gluing the smaller sections of tube to the sides. When dry the rocket ‘lid’ can be put on. To make the windows or portholes (although technically space rockets don’t have either!! 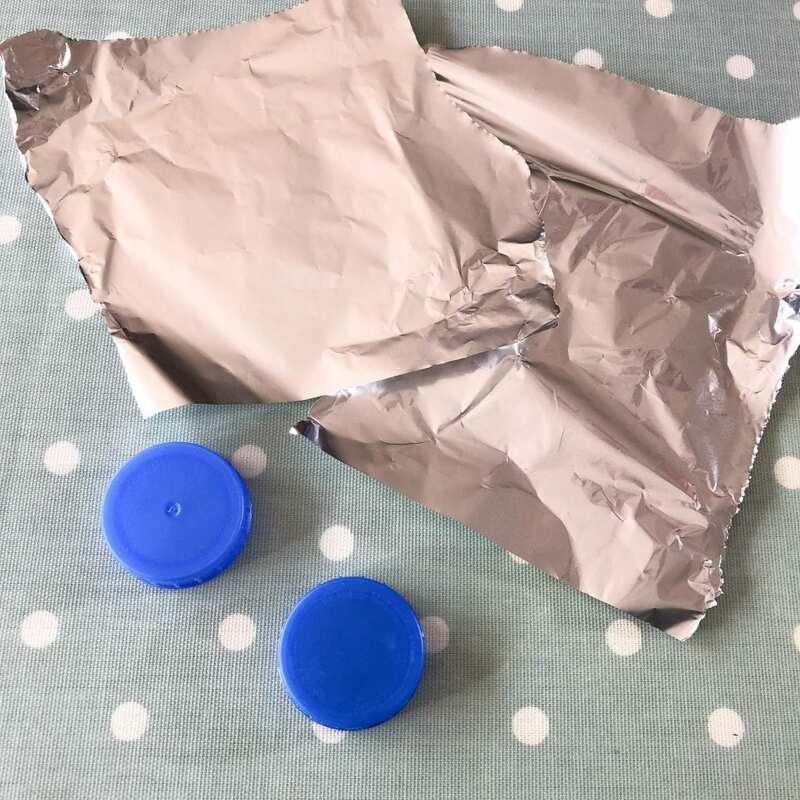 ), you can wrap some old milk bottle lids in tin foil, and stick them to a contrasting circle of card before gluing to the rocket. That’s it! 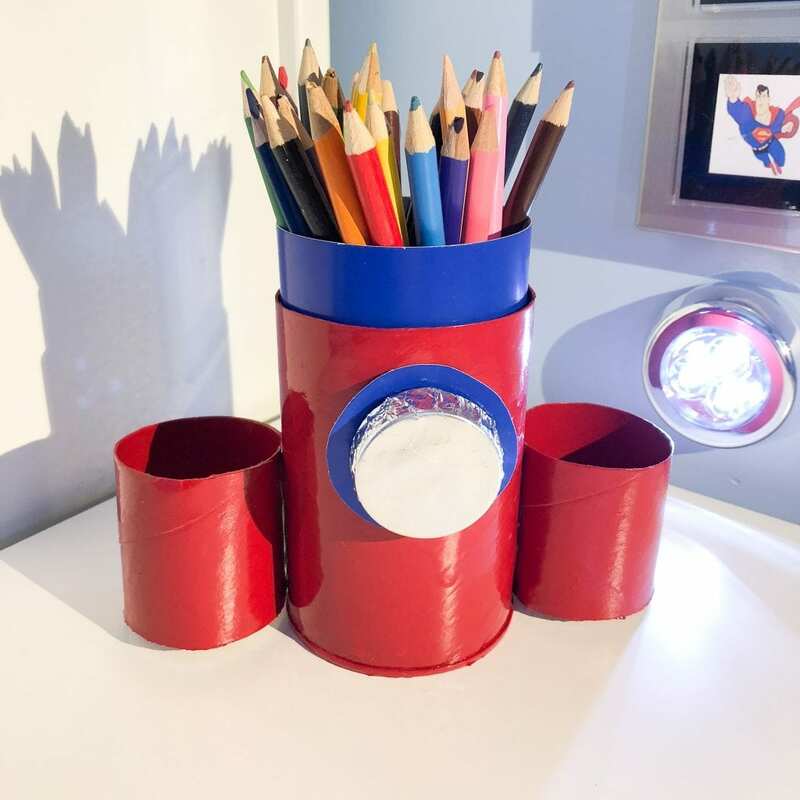 A simple Rocket Desk Tidy made from throw away material, that looks effective and is practical too. 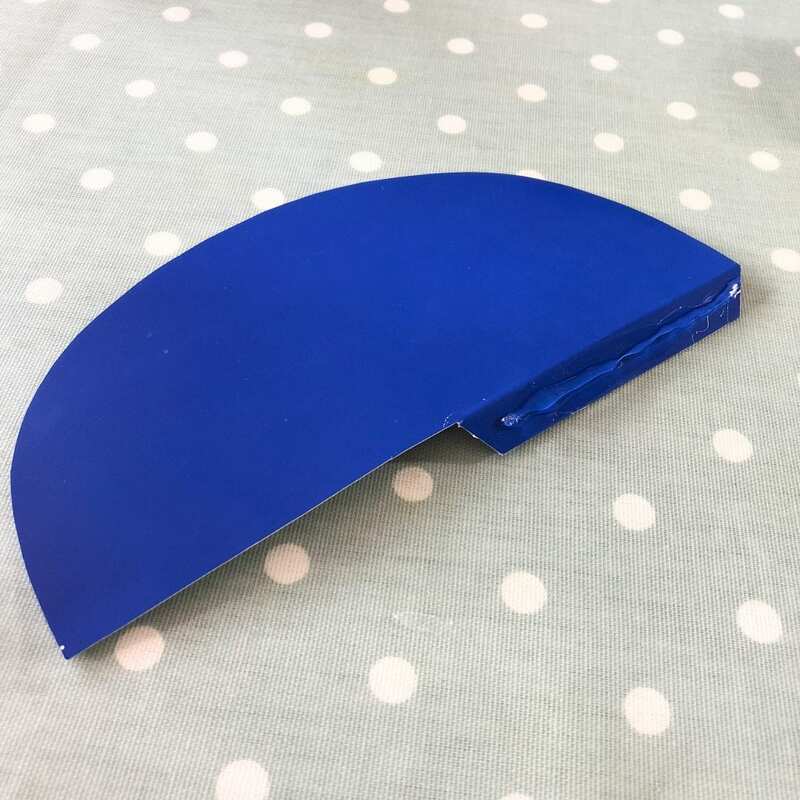 So what do you think of our Space Rocket Desk Tidy? Is it something your kids would like for their bedrooms? Please do let me know if you make one, I’d love to see it! My little boy loves it, and I honestly couuldn’t find anything similar in the shops. Thank you! My little boy loves it, so I suppose that’s all that matters!